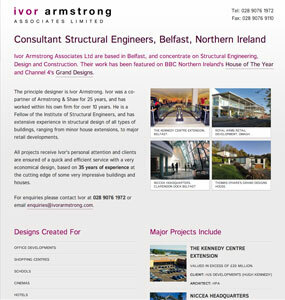 Structural Engineering Consultants based in Belfast, whose work has been featured on BBC Northern Ireland's House of The Year and Channel 4's Grand Designs. 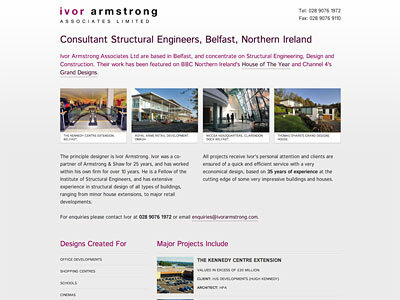 Ivor Armstrong Associates have been trading for over 10 years, but have never before had a website, put off by the high prices others have quoted. 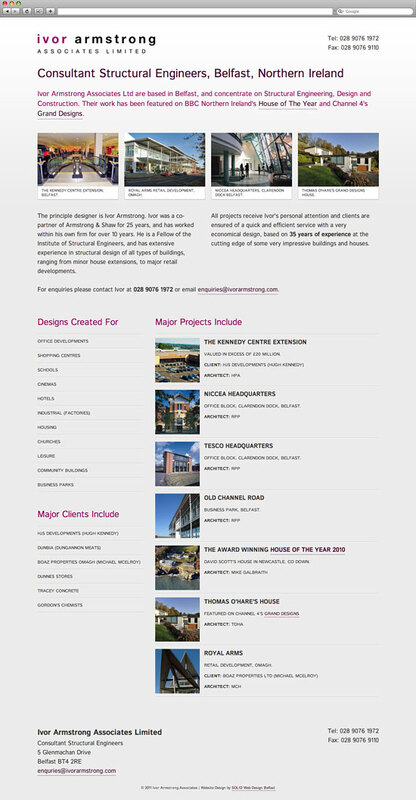 We were able to offer them a single page website that contained all necessary information without stretching their budget. We designed the site to be fully responsive, meaning that no matter what type of device or screen a potential customer is using (from mobile phones and tablet computers to large 24 inch iMacs), their site would be presented in the most effective manner. Mobile devices will see a single column layout, suitable for the smaller screen, while devices with larger screens get a highly impacting 2 column experience (see screenshots below).